FROSTBUSTER - Agrofrost Canada Inc.
Don't look for a cheaper protection per acre because you will find none. Even more, the Frostbuster has several advantages compared to other frost protection systems: you can protect your crops in places where no water is available, or protect fruit which cannot be protected with water. It can be used not only during radiation frost but also during wind frost, and a lot of farmers use the Frostbuster to improve fruit set. The Frostbuster is a trailed or 3-point mounted machine. The powerful fan is driven by the PTO of the tractor. A propane burner heats the air up to 80-85°C. The heated air is blown between the trees through 2 outlets (1 at the left and 1 at the right). The total surface that can be protected depends on the shape and dimensions of the plot and on the model and is maximum 18 to 24 acres. Instead of warming up the atmosphere, the Frostbuster uses phase transition to protect your orchards and vineyards. In a few words: by controlling the ice forming and by recuperating the energy that is liberated when vapor changes into ice., it provides an excellent protection with a minimum input of energy. THERE ARE 4 DIFFERENT MODELS: ONE TRAILED MODEL AND THREE 3-POINT MOUNTED MODELS. • New pulse burner with burner controller and ionization sensor, which makes it the safest burner used in agriculture. 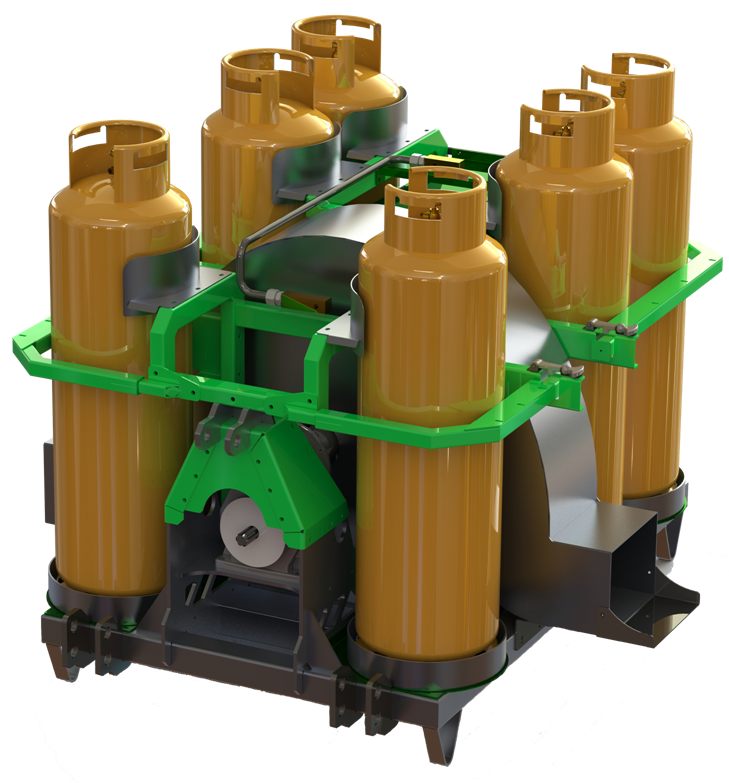 • The F501 can hold 8 propane bottles, so it has a bigger autonomy, up to 10 hours. • Possibility to start up the burner automatically, depending on the RPM of the fan: if a certain speed level (RPM of fan) is exceeded, the burner will start automatically. When the speed drops back below this level, the burner will be switched off. • Gear box with overrunning clutch. • The temperature can be adjusted from the control box in the tractor's cabine (option). In many countries, farmers do not have tractors of 65 HP or more. To help these farmers, we decided to develop a few 3-point hitch mounted machines, that requires less horsepower. These machines have a 2-speed gear box. On the lower speed, less horsepower is needed. Of course, the protected area will be smaller. We can also install a special impeller in the fan to reduce the needed power to 25 HP. To have most weight as close to the tractor as possible, the fan is mounted vertically and two propane bottles are put in front of the fan. ​The F252 can be delivered with the outlets below or with the outlets in a higher position (F252H). There's also a version with only 1 outlet to one side.